I know you’re angry before you even read this article. How could a responsible baseball site allow the publication of such heresy? Let me try to cool your jets so you can read what I have to say. Then feel free to judge. Please understand, I’m only talking about the effect of the batter’s grip during the short time of the ball-bat collision – less than one-thousandth of a second. The grip certainly does matter during the one-third of a second or so needed to get the bat from the ready position into the hitting zone. That, however, is a topic for hitting instructors, not physicists. Physicists have long made the argument that the grip of the batter during the collision between a well-struck ball and the bat has no effect on the outcome of said collision. Probably the first published article to make this argument was by Brody in 1990. There have been experimental verifications of the fact that grip doesn’t matter, although none have been as convincing as the one that occurred on May 27, 2012. 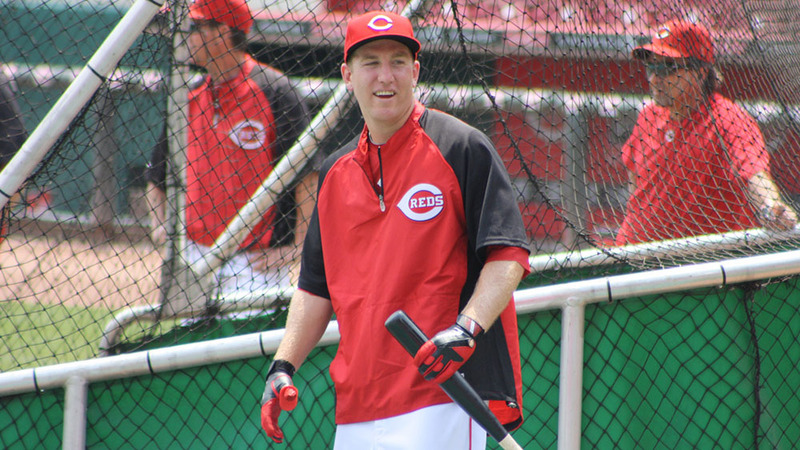 Todd Frazier, then of the Cincinnati Reds, hit a home run. Slow motion video shows the ball struck the bat after the bat had actually left his hands. His grip certainly didn’t matter since he wasn’t even touching the bat! There seem to be two physics-based arguments about the grip not making a difference. One has to do with the forces exchanged between the bat and the ball during their collision. This argument is based on modeling the bat as a rigid, inflexible object – a rigid body. The second argument treats the bat as a flexible object – a non-rigid body. A collision with the non-rigid bat initiates a wave along the bat. 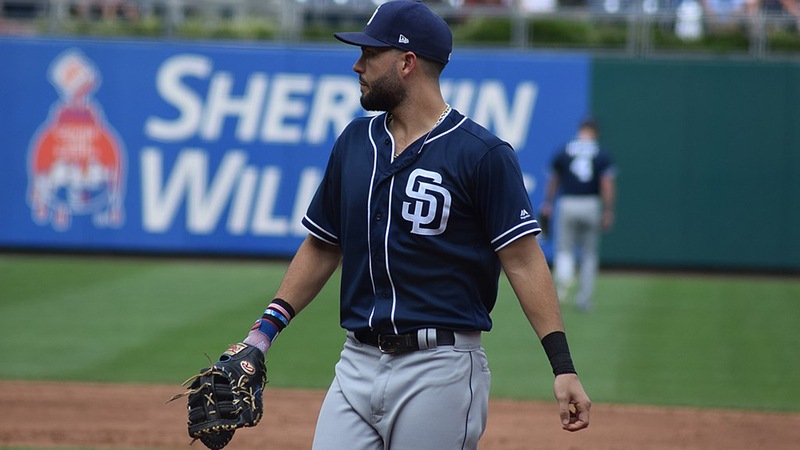 The rigid-bat argument hinges on the understanding that the force exerted by the batter during the short time of the collision can be neglected in comparison to the very large force exchanged by the ball and bat during their interaction. The collision times for well-hit balls are known to be on the order of 0.5 milliseconds. The weight of the ball is 5.125 oz (0.145 kg). The change in velocity of a ball hurled with a pitch speed of 100 mph and swatted back with an exit velocity of 100 mph is 200 mph (89.4m/s). These values in the equation above would calculate forces that can be as large as about 6000 lbs (27kN). One can estimate the average force a batter can exert by realizing they are speeding up a 36 oz (1.0kg) bat from rest to about 75 mph (34m/s) in about 0.3s. The result is about 25 lbs (110N), less than half a percent of the force exchanged between the bat and the ball. The force exchanged between the ball and the bat is smaller when a slower pitch, such as a curveball, is hit weakly off the handle. The collision time might double while the change in velocity might drop in half. The result would be a force that is about four times smaller, or 1,500 lbs (6.7kN). In such a case, the hands exert a force still below two percent of the ball-bat force. This rigid-bat model shows that the force exerted by the batter is so small compared to the ball-bat force that it can safely be neglected. In other words, it is hard to see a way the grip can make any appreciable difference during the short time the ball is in contact with the bat. Deeper discussions of the ball-bat collision describe the waves created in the bat modeled as non-rigid object. The argument for the grip not making a difference is associated with the timing of the wave pulse incited in the bat by its collision with the ball. The motion of such waves can be seen in high speed video. The argument goes, for balls hit on the barrel, the wave pulse doesn’t have time to travel from the barrel to the batter’s hands and back to the collision point before the ball has left the bat. This can clearly be seen in the video. So, while the batter’s grip might affect the wave pulse once it gets to his hands, that information can’t get back to the ball before the ball has left the bat. The ball must then be unaffected by this wave. It should also be mentioned here that a ball hit near the sweet spot barely generates a wave in the bat at all. So, very well hit balls have definitely left the bat before they feel the wave. It was explained above, in the rigid bat model, that the grip does every-so-slightly effect the ball because there is a force of a few tens of pounds exerted on the bat by the batter during the collision. However, this force was so small compared to the force the bat exerts on the ball that it can be ignored. There must be a similar approximation hidden in the non-rigid bat model. It turns out that every wave pulse is composed on many difference frequencies. To understand how this works would require and understanding of the Fourier Transform. Since I see you aren’t interested in going that deep, just understand that the pulse includes low frequency as well as high frequency components. The high frequency waves travel faster and do make it back to the ball before it leaves even though the low frequency waves don’t. So, why does the non-rigid bat argument seem to work? First, the wave pulse does not distribute much energy into the high frequency components compared to the low frequency ones. That’s why the pulse stays pulse-like during the video and why the batter’s hands don’t feel the high frequencies. Both the rigid bat model and non-rigid bat are correct and both contain slight approximations. The rigid bat model ignores the small amount of force the batter exerts during the collision and the non-rigid bat model ignores the small amount of energy in the high frequency parts of the pulse. So, take your pick – whichever model you like better. But the most important point, and the one that continues to be missed by the baseball community, is that the grip of the batter during the collision makes no difference to the flight of the ball. Of course, a hitting coach knows that grip can make a critical difference during the third of a second required to get the bat to the hitting zone. This third of a second is over three-hundred times longer than the ball-bat collision time I’m talking about. Perhaps that explains the pay differential between hitting coaches and this physicist. So i guess Ken Harrelson needs to update his autobiography, Hawk, and add a footnote as to why he inaugurated the glove as a standard batting accoutrement. These conclusions disagree with my intuition. This makes me angry and confrontational. I demand proof. Your numbers do not immediately validate my viewpoint, thus enraging me further. Q.E.D. you are wrong, the earth is flat.